As more businesses turn to the Internet of Things (IoT), security and privacy are often top of mind. Our goal at Microsoft is to keep our customers' IoT solutions secure. As part of our ongoing security efforts, we recently launched the Security Program for Azure IoT, which provides customers with a choice of security auditors who can assess their IoT solutions from device to cloud. Microsoft also offers comprehensive guidance on IoT security and state of the art security built into Azure IoT Suite and Azure IoT Hub. Today, we’re excited to announce another important security feature: IP filtering. 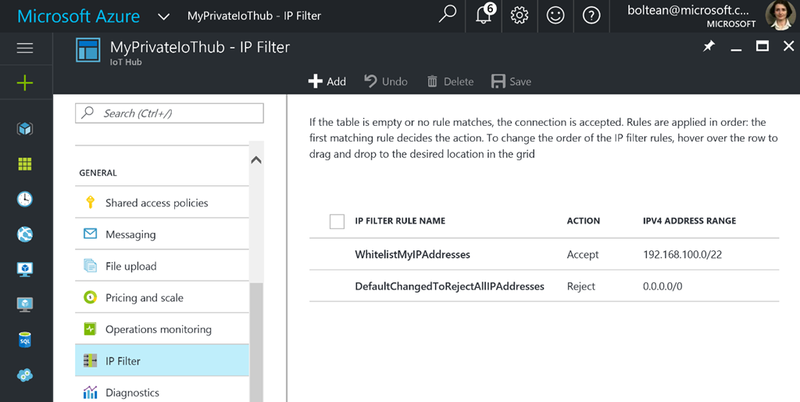 By default, Azure IoT Hub is configured to accept all IP addresses to be compatible with the existing customer configurations prior to providing this feature. In this example, any time a device or a back-end application with the rejected IP address connects to this IoT Hub, it will receive 401 Unauthorized error. The IoT Hub administrator will see this being logged, but the malicious attacker will not receive any further error messages. The CIDR (Classless Inter Domain Routing) format makes it easy for the IoT Hub network administrator to accept or reject a range of addresses in one rule, so 192.168.100.0/22 will translate into a range from 192.168.100.0 to 192.168.103.255. For those who are not network administrators, there is plenty of documentation online that explains the complexity of the CIDR format or provide calculators. One of our favorites is here. By adding a last rule that rejects 0.0.0.0/0, the administrator changes the default to be blacklist. The illustration below shows an IoT Hub that whitelists only the 192.168.100.0 to 192.168.103.255 range. Note that the order is important and the first rule that matches the IP decides the action. 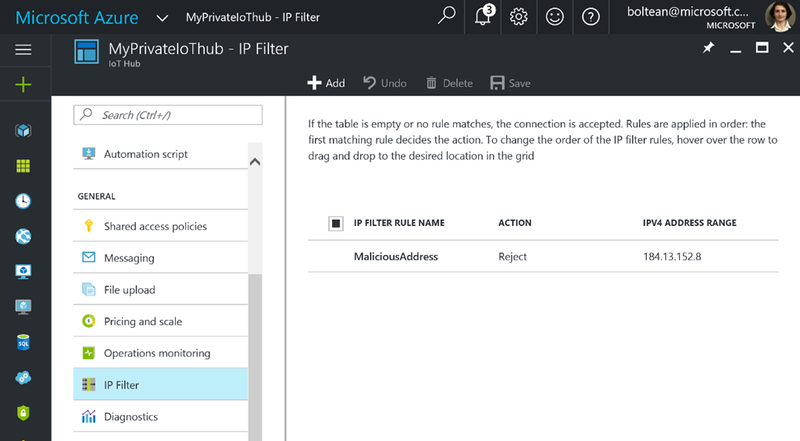 Finally, while IoT Hub already supports private connections using Azure Express Route, IP filtering enables an additional level of security by enabling administrators to only accept private Express Route connections. To enable this, you would use IP filtering to accept connections from Express Route and then reject all others.